Time: 2:41:37 Pace: 3:49/km Nutrition: 4x SiS Lemon/Lime Gels. 1x SiS Raspberry Electrolyte Gel. Water. The hottest day of the year welcomed Brin, Kerry, Alec and myself to Brighton, which for me was the culmination of around 2000 training kilometres to see how far I could lower my PB. Having qualified to go off the smaller Withdean start (sub 3:20 runners) I said my goodbyes to the others and settled into my pre race routine. I'd been following an ultra high carb diet for the three days leading into the race, taking in around 800g a day, to keep those glycogen levels as high as possible before the gun went off. Basically lots of pasta, bagels, bread and couscous. The morning diet consisted of 2 bagels / spread at 05:30, clif bar at 06:30, 2 bananas at 07:30, electrolyte gel at 08:45, all washed down with the SiS energy drink that Sarah had kindly given me. Being honest I didn't feel great on the start line, maybe nerves, but think the drastic change to my diet wasn't the best move. However I didn't have time to dwell.. I stuffed two SiS gels into my shorts, strapped two to my hands and prayed the sun wouldn't shine as much as the forecast had promised. Brighton had taken a stance not to invite any athletes from Africa and so the elite field consisted entirely of British athletes. Knowing some of the names on the sheet I thought the finishing time could be around 2:25/2:28 depending on conditions, so set out to target a 2:35 finish. The first half takes you through the centre of Brighton the out towards Ovingdean to the east. If there was any downfall in the race it was not giving the hills the respect they deserved while climbing out of town. There was also a challenging headwind building, the heat rising and the elevation growing. However I felt ok, so pushed on and went I went through half way in 9th with 1:15 on the clock. The second half is much flatter, but I could tell my pace was starting to fade away... I'd over done it on the tough hills and was now paying the price. The SiS gels were going down surprisingly well, but they couldn't possibly refill the quickly emptying tank. The crowd support in this part of the race is insane. It's lined pretty much all the way, with people shouting encouragement as the runners speed past. 30k came up in 1:49, so I knew if I could just keep it steady then I'd still be on for a respectable time, but my 2:35 target had been dashed, so reassessed to try and keep my pace below 3:47/km and secure a sub 2:40 time. The back end of the route is probably the worst section of any course I've ever ran and that's saying something! You head through an industrial estate, but ZERO support, instead you're greeted with the smells from the sewage works and solitary baking hot roads. Running through a timber merchants provided some amusement, before the 8km straight line to the finish. This was brutal to say the least. There would be 8km of solid headwind as the temperatures were now nudging over 20 degrees, the mental toll was starting to set in. Also where the course runs along the promenade for the final 6km it's completely open to pedestrians, holiday makers...well every man and his dog! And at this end of the race there is only a runner coming past every few minutes, so you were having to shout (in a very polite way) for people to move out your way. Not easy when your mind is going, legs are dead and can't make too many sudden changes of direction to jump over a pet dog! As 40k came up I knew the 2:40 target had gone, so had to make a new one. Try and beat Sarah's Manchester time by an hour :-) It's bizarre the stuff that goes through your head as you race, playing with numbers and recalculating, but at least this target made me smile. The finish line was now in sight and I was still running relatively strong, I hadn't hit the wall completely so was pleased the nutrition had worked ok. 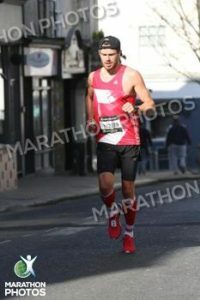 Crossing in 2:41:37 knocked 3 minutes off my PB, which given the conditions I had to accept was an ok result. I had a quick chat with Ollie Garrod, who'd been at half way in 10th and powered through to place second, a brilliant run! Then the first female crossed shortly after, Helen Davies, who'd just returned to running after having her second child, another top run. Thank you to the young lady from St Johns ambulance who kindly got me a medal as I was recovering on the floor! It was then off to find my bag, read some lovely texts from those who'd been following me via the app and wait for the others to finish. 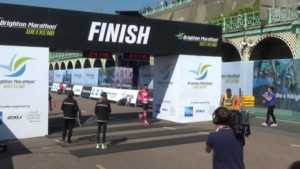 Brin came in with a awesomely paced 3:27, his girlfriend Kerry in her first ever marathon ran a hugely respectable 4:05 and Alec off very minimal training since having his first child finished in a brilliant 3:25. As the sun beat down it was time to reflect on what had been a lovely day out at the seaside, PB's a plenty and for me so much learnt ahead of VLM in 2 weeks time.